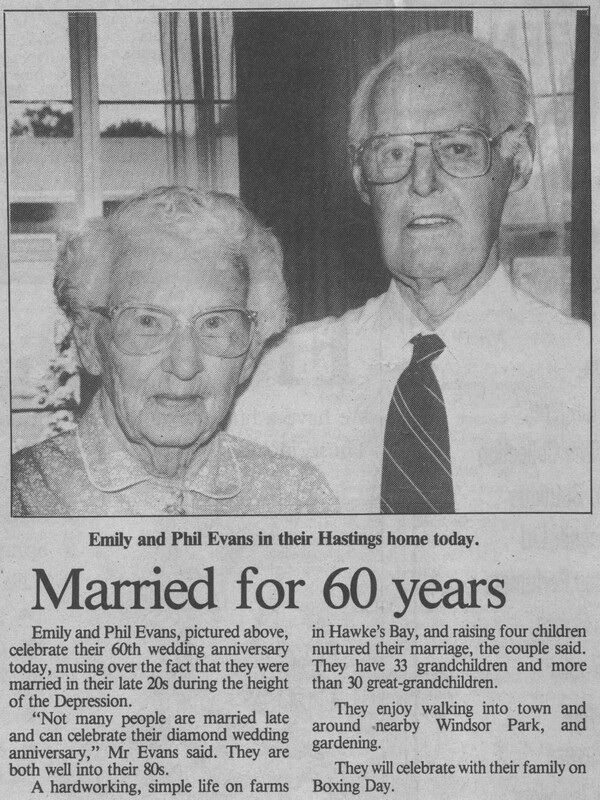 Emily and Phil Evans, pictured above, celebrate their 60th wedding anniversary today, musing over the fact that they were married in their late 20s during the height of the Depression. “Not many people are married late and can celebrate their diamond wedding anniversary,” Mr Evans said. They are both well into their 80s. A hardworking, simple life on farms in Hawke’s Bay, and raising four children nurtured their marriage, the couple said. They have 33 grandchildren and more than 30 great-grandchildren. They enjoy walking into town and around nearby Windsor Park, and gardening. They will celebrate with their family on Boxing Day. Photo caption – Emily and Phil Evans in their Hastings home today.